The purpose of the study is to assess the reader agreement and accuracy of eight ultrasound imaging features for classifying hepatic steatosis in adults with known or suspected hepatic steatosis. This was an IRB-approved, HIPAA-compliant prospective study of adult patients with known or suspected hepatic steatosis. All patients signed written informed consent. Ultrasound images (Siemens S3000, 6C1HD, and 4C1 transducers) were acquired by experienced sonographers following a standard protocol. Eight readers independently graded eight features and their overall impression of hepatic steatosis on ordinal scales using an electronic case report form. Duplicated images from the 6C1HD transducer were read twice to assess intra-reader agreement. Intra-reader, inter-transducer, and inter-reader agreement were assessed using intraclass correlation coefficients (ICC). 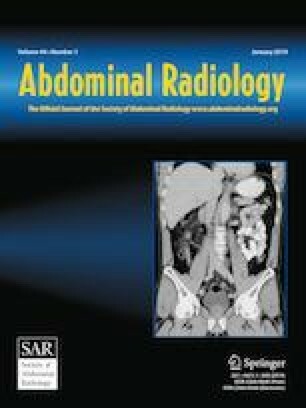 Features with the highest intra-reader agreement were selected as predictors for dichotomized histological steatosis using Classification and Regression Tree (CART) analysis, and the accuracy of the decision rule was compared to the accuracy of the radiologists’ overall impression. 45 patients (18 males, 27 females; mean age 56 ± 12 years) scanned from September 2015 to July 2016 were included. Mean intra-reader ICCs ranged from 0.430 to 0.777, inter-transducer ICCs ranged from 0.228 to 0.640, and inter-reader ICCs ranged from 0.014 to 0.561. The CART decision rule selected only large hepatic vein blurring and achieved similar accuracy to the overall impression (74% to 75% and 68% to 72%, respectively). Large hepatic vein blurring, liver–kidney contrast, and overall impression provided the highest reader agreement. Large hepatic vein blurring may provide the highest classification accuracy for dichotomized grading of hepatic steatosis. The authors acknowledge Grant support from the National Institutes of Health T32 EB005970-09 and R01 DK106419-03. The study was also supported in part by an investigator-initiated research grant from Siemens to the senior and second senior author. No author of this study is an employee or consultant to Siemens. All data belonged to the authors who had complete control of the manuscript content. The senior author has research grants from Siemens, GE, Philips, and Bayer. C.W.H., A.W., T.W., J.P., S.F.D., A.S.N., E.H., L.D., C.Q.L., A.W, H.J.J., C.F.D., G.C., M.O.B., K.M.R., M.A.V., and M.A. declare that they have no conflicts of interest. F.P. is on the advisory board and speaker bureau of Bayer, on the advisory board of EISAI, on the speaker bureau of Bracco, and has a research contract with ESAOTE. R.L. receives grant funding from Adheron, Arora, BMS, Daiichi-Sankyo Inc., Galectin, Galmed, GE, Genfit, Gilead, Immuron, Intercept, Janssen Inc, KineMed, Madrigal, Merck, NGM, Promedior, Prometheus, Siemens, Sirius, and Tobira and is a consultant or on the advisory committee for Bird Rock Bio, BMS, Boehringer Ingelheim, Celgene, Conatus, Eli Lily, Enanta, Gilead, GRI Bio, Madrigal, Metacrine, NGM, Pfizer, Receptos, Sanofi, Scholar Rock, Zafgen, Arrowhead Research, Conatus, Galmed, Gilead, Intercept, NGM, Nimbus, Octeta, Tobira, GIR, Inc., and Metacrine, Inc. C.S. receives grant funding from Gilead, GE Healthcare, Siemens, GE MRI, Bayer AMRI, GE Digital, GE US, ACR Innovation, performs contracted research for ICON Medical Imaging/Enanta, Philips, Gilead, Shire, VirtualScopics, Intercept, Synageva, is a consultant for Boehringer Ingelheim, is a member of the external advisory board of AMRA Medical and Guerbet (fee paid to the University of California Regents), and a speaker for GE Healthcare and Bayer (fee paid to the University of California Regents).